S&P 500 futures rallied towards the 1103 resistance level Tuesday and it needs to break above this 1103 level to open for any stronger rally. We also note that Gold once again bounced off the 1075 Friday, which is a strong support level. We expect a rally in Gold near term as it bounced very strongly off this 1075 level for a second time over the last 2 month, which signals that gold is a buy on dips above this level for the moment. The Euro continues to be pressured on Greece and uncertainty over the single currencies ability to get over this debt crisis. There is a real problem for the Euro zone as Greece is probably not the last country to need financial aid to survive. The question is how long the healthy countries like Germany and France are willing to bail out the weak members? Should the failing states be omitted from the Euro? If Greece is bailed out, why should not Portugal, Spain or Italy be bailed out as well if they would face the same problem. Suddenly there is a fair amount of problems to solve, which if everything goes terribly wrong simply threaten the future of the Euro. That is what is putting pressure on the Euro and the ability to rally seems very weak as it got sold pretty hard after breaking briefly above 1.40 today. From yesterday’s report: EMU is facing challenges with member states in different economic cycles and the problem is of course that the countries have no way to adjust the monetary policy to the country’s need and problems. So it all ends up with a big compromise that really is not perfect for anyone, which is of course not optimal. JPY has looked weak since the strong open on Monday and we favor more weakness going forward due to weak Japanese fundamentals and low interest rates for a long period of time. 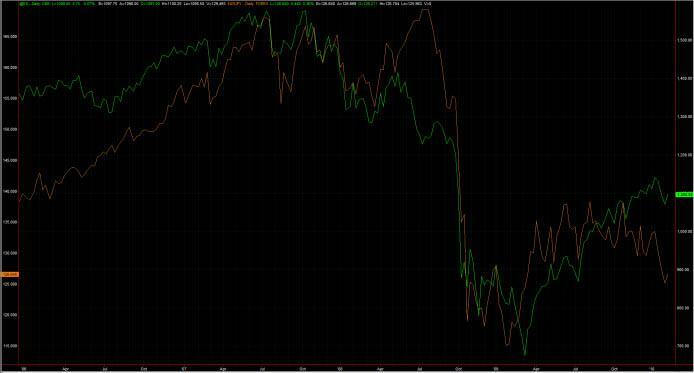 EURJPY vs. S&P 500 futures, see how the correlation has been totally off the last few months, but returned last week or so. Crude oil tested the 78 USD per barrel overnight, but resistance held and it traded quite a bit lower during the afternoon and back below the 77 level at the time of writing. The supply is still high in Crude that limits the ability to get and stronger rally going. Euro: Failed just above 1.40 this afternoon and technically weak below 1.4030. We see key resistance up at the 1.4216 level that was former reaction low that we expect to be tested near term. Cable: Was rejected above 1.64 level last week, but seems well supported down at the 1.5830 level. Former triangle support (now resistance) coming in at 1.6123 today that should cap the upside for now. USDJPY: We see longer term falling trend line coming in at 93.65, which is still the key level to break to open for a stronger run higher. We have 50% Fibonacci of the move from 84.83 to 93.76 coming in at 89.29 that basically provided support last week and saw it bounce off 89.13. Longer term we still expect JPY to underperform due to high public debt, weak demographics and tougher export markets due to slower growth going forward. Swissy: Took out key 1.0590 resistance level and bullish above 1.0480 now. We note that key falling resistance from the October 2009 high is coming in at 1.0966, of course not in play at the moment, but something we like to have in mind. AUDUSD: AUD selling off on the RBA rate announcement. Looks like a test of 23rd of Dec low at 0.8733 might be on the card. USDCAD: Tested the 1.07 level as we expected and made high of 1.0720 yesterday, but reversed sharply to close way off this high. That certainly looks like sellers taking over and we expect lower levels next few sessions. EURJPY: Strong bounce off the mid 124 level seen Monday morning. We see resistance up at 127 that needs to be taken out to really put a short squeeze on the cards. GBPJPY: The move below 145 opened for a test of the 143.00 support level, which is the former overhead resistance line, now support that has held as support since it was broken on 30th of December 09. We see key resistance up at the 151 level. AUDJPY: Still trading inside the Rising trend channel from 13th of July with support down at 79.19 and overhead resistance at up at 89.22 and it basically testing the rising support level this morning, could be interesting to look for a long down here.